UnCorked Art Nights- ARTY PARTY! Easy and Fun for Everyone! Never picked up a paintbrush? Isn’t it about time you tried? What are you waiting for? Remember Mikey in the old LIFE Cereal commercial? There’s a new trend in art experiences that is sweeping the nation: it involves helping inexperienced painters pick up a brush and complete a painting in one sitting, even if they have never painted before. Common to this trend is a low key environment, room to bring your friends along, the ability to BYOB, and an instructor capable of leading the process and helping you along. There are numerous franchises out there catering to this trend: Wine and Design, Painting with a Twist, etc. These franchises do not own the concept, they merely market and cater to it exclusively. I LOVE THIS CONCEPT! What I love about it, is the idea of taking art and making it accessible to ANYONE. 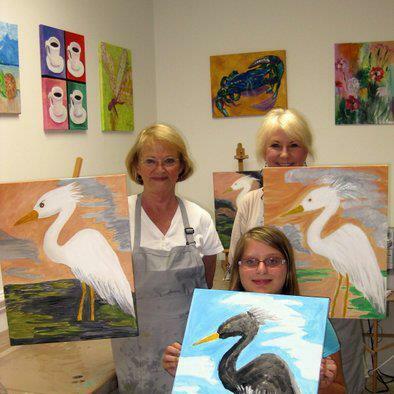 We are offering these kind of experiences at Art and Soul Gallery, Cafe and ART CENTER in Myrtle Beach! The images on this blog post are just a few of the paintings which can be done if you were to join us. or feel unable to express themselves artistically? Painting is a “craft that can be taught” not “something you’re born with”. That’s what I’m talkin’ about!! which simply needs to be nurtured & encouraged. 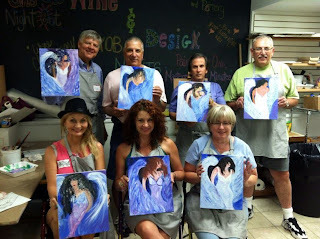 I think that’s why I love the idea of getting friends together to paint for an evening…sharing a bottle of wine, some snacks, some laughs…and doing something creative and different together. We all go out for dinner when our budgets allow. Maybe we go to a movie or the beach together if we get ambitious. Maybe your night out with friends involves cards or watching TV. Taking an evening to make a memory and then have a souvenir of that evening seems so much more unusual and fun! Have you been afraid to try because you don’t feel you have the talent? I’ve heard some high-brow artists turn up their noses at the idea of encouraging painting in an evening while drinking wine. Perhaps they are threatened by the idea that anyone might be able to do what they do without taking it seriously. They want to keep the unattainable mystique surrounding art, perhaps because they feel threatened by art becoming “common”. However, I believe that the attempt to paint will only increase your appreciation of those who really know how to paint well. Like playing an instrument, you begin to appreciate the incredible talent of a virtuoso when you try it yourself. I say, the more people who are interested in art the better! Art has become my personal antidote to stress, a source of friendship and fun, a job, a passion, a love-affair which always affords something new and fresh. I don’t feel threatened at all by making art fun and easy for people to enjoy successfully. In fact, my enthusiasm is almost evangelical…it’s a gift I’ve been given that I want to share with everyone! When I host a painting party in Wine and Design BYOB Night format I make it a ‘No-Fail’ experience. In fact, there are even stencils available to trace the images so you can paint that much sooner! Experience the PROCESS of painting. Enjoy the sensual feel of the paint on the canvas, the excitement of color, and the exhilaration of expressive lines…this is what these nights are all about! Sharing it with friends in a mutually supportive, low key setting, just makes it better. Are you someone who always loved art, but didn’t have the opportunity to paint? or a great DATE NIGHT? Email me or post a comment and I will be happy to help you have a fun, memorable, and NO FAIL art experience!